Canadian artist Adeline Halvorson enjoys a variety of diverse subjects, but her favorite subject is equine. Hanson paints with oils and pastels and is noted for her very realistic and highly detailed works. She paints a variety of subjects and her work reflects her love of the West. She is especially fond of painting horses. Chris Owen's working cowboy themes are a representation of authentic operating ranch activities. He paints predominantly with gouache. Craig Tennant has been involved in the art world since 1967. After moving West in 1989, he began to concentrate on his fine art oil paintings and his talent quickly gained national recognition. Growing up, Texas native, Donna Howell-Sickles' ranch provided the first inspiration for her love of nature & animals. She decided to become an artist in college and since that time, her art and her family have been the center of her life. Frank McCarthy (born 30 March 1924 — 17 November 2002) was a prolific American artist and realist painter renowned for advertisements, magazine artwork, paperback covers, film posters, and paintings of the American West. Gordon Snidow has been known as the foremost chronicler of the contemporary cowboy for over forty years. He is a leader in the development of the American Western Art Movement, and is one of America's out-standing fine artists. Jason Rich rides alongside cowboys working the corrals or packing through the mountains then combines experience, imagination and research to depict authenticity of the cowboy way. Utah artist, Jeremy Winborg is best known for his figurative work of Native American subjects that blend realism with abstract backgrounds. Noles’ oil paintings feature the domestic life of the 1800’s Native American. Noles spends hours researching each painting, collecting reference and museum books on early Native American life and visiting museums to photograph their exhibits. She then incorporates the “realism” of her research with her inner images. One of the aspects Noles enjoys most about painting this time period is the depiction of the bead and quill work for which the Native Americans are so well known. The paintings of Loren Entz reflect many things - his love for beauty, simplicity, grace, gentleness, and a timeless, personal relationship between his subjects and the world. Whether he is doing a simple study of a young girl picking flowers or of a mother and daughter engrossed in home chores, Entz’ art captures the heart, soul, and beauty of his subjects and their environment. Michael’s fluid acrylic paintings create unique imagery inspired by the rugged spirit so vividly seen in the west. Morten E. Solberg is acknowledged as a Master Artist. He is versatile in all mediums. He paints in oil, acrylic and watercolor and his techniques range from photo-realism to total abstraction. In 1979 Terrance Patterson retired from a full time job as a Commercial Artist and Exhibits Designer. To him, art was a way of life and gave him a way of expressing himself. His comments on his profession, "I have been drawing and sculpting for as long as I can remember, and I want to pursue my real love, sculpture exclusively." Terrance developed a business in affordable art castings made in Foundrystone, which are sold and shipped world wide. Although, Terrance passed away in 1991, his wife and youngest son Todd still maintain this business. 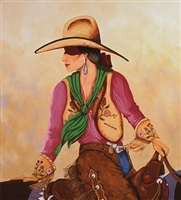 Terri Moyers has aspired to create Traditional Cowboy Prints and Cowboy Art since childhood. Her natural affection for the West is evident in all of her works. For more than forty years, Tom Ryan has painted the contemporary cowboy. His paintings capture a way of life unique to the time and place, yet universal to those on horseback who tend cattle. Tom was born in Springfield, Illinois, in 1922, one of nine children. His father owned a stable, so young Tom was riding, and drawing horses, by the time he was 7. After high school, he attended the St. Louis School of Fine Art and served in the Coast Guard. After WW II, Tom studied at the American Academy of Art in Chicago and enrolled in the prestigious Art Student’s League in New York City. For the next eight years, he illustrated hundreds of magazines and book covers.